Spark plug HOLA consists of metal body, fixed insulator, contact rod, center and ground electrodes. Interference-suppression resistor is situated between contact rod and center electrode. Electrodes are made of nickel alloy with copper core, which increases the heat removing and improves spark plug thermo elasticity. There are paddings of refractory metal (platinum, iridium) in spark gap on center or both electrodes of several spark plugs, which are resistant to electrochemical erosion, that extends operating life of spark plugs by several times. Insulator is made of ceramics with a high content of aluminum dioxide and combines high mechanical strength with satisfactory insulation properties. Insulator is sealed in body with thermal shrinkage technology. Corrosion resistant galvanic plating is used for metal body. 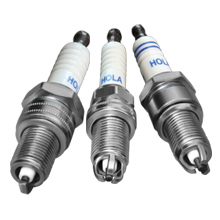 Advanced materials and technologies are applied to production process of spark plugs HOLA ™, raw material and each part of HOLA spark plugs permanently fall under quality control during production. Manufacturing is organized in full accordance with ISO/TS 16949 requirements. Smooth engine ignition under low temperatures. Estimated operating life of HOLA™ spark plugs is 30 000 - 60 000 km run (depends on spark plugs construction) *.